We're a little late on this (past few days have been quite busy...) but Larry Lessig's SuperPAC to end all SuperPACs has hit its first target way early. 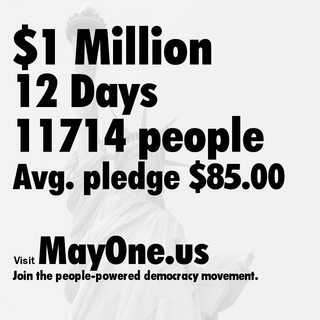 As you hopefully remember, the goal was to reach $1 million in 30 days, which would then be matched by an (as yet) unknown donor, followed by a second campaign to raise $5 million in June -- again matched by a donor. The plan then would be to use the $12 million to work on a few specific Congressional races to prove that it can have an impact, and then kick off in 2015 with a much bigger campaign to have an even larger impact. There's still a long way to go, but this seems like a great start: Hopefully Lessig and the organization he's putting together will release some more data as well. $85 average is good to see, though I'd love to see more information on the breakdown of donations, including some sense of the distribution and median donations as well. The fact that it was funded alone should speak tons in a very loud volume just by itself. People are fed up. Maybe it's not a moonshot after all. Maybe people just needed someone to start the engines. Ok, that's what I was waiting for. I'll do it. I'll donate.